This Sunday, August 19 two cricket teams will make the trip through from Edinburgh to Paisley to play in the Citylets Scottish Cup final - and it promises to be a cracker. Heriot’s and Mazars Grange will play at Ferguslie’s Meikleriggs ground and Scottish Cup finals are always special. At one stage during the semi-final weekend in July it looked like neither side would be progressing to the showpiece event. Arbroath and Ferguslie were in charge of the two last four ties at Goldenacre and Portgower Place respectively until Chris Ashforth (Heriot’s) and Preston Mommsen and Tom Mackintosh (both Grange) came to the rescue. Against Heriot’s, Arbroath won the toss and went on to make 287-9. 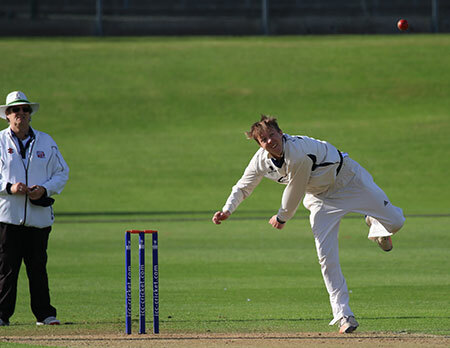 Skipper Keith Morton took four wickets for Heriot’s. In their reply Heriot’s lost Elnathan Meiri and Hayes van der Berg early on. After 40 overs Heriot’s had lost four wickets and needed a further 93 to win. They came through though by five wickets, Ashforth leading the way with a brilliant 89 off 54 balls. Against Grange, Ferguslie won the toss and decided to bat first. They got off to a relatively slow start before Michael English and Riyaad Henry came together. The former hit a superb 109 with Henry making 93. That helped their side up to 273-9 from their 50 overs. In reply Grange batted well and they needed 11 off the final over with captain Preston Mommsen (90 not out) and Mackintosh at the crease. Mackintosh, who is only 15, hit a six, a two and a four off Henry to spark wild celebrations, ending on 17 not out as they won by three wickets. Morton (pictured above), the 28-year-old spinner who will be playing in his third Scottish Cup final, said of that Heriot’s win over Arbroath: “What a game of cricket to be involved in and I will remember it for a long time. “Ever since I was young I have been hooked on the Scottish Cup and always given it a lot of importance. I was lucky enough to play in a final with my dad [Willie, the former Scotland player] for Penicuik when I was a teenager and although we lost that one it made me determined to get back to the showpiece game again. Heriot’s have won the Cup three times previously in 1978, 2000 and 2012 and the current crop are keen to mark the 40th anniversary of the first win with a fourth. 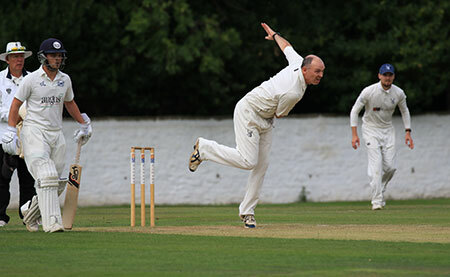 Stuart Davidson (pictured), now 46 and out of first team retirement to spearhead the Grange bowling attack this summer, has played his part in a number of Cup triumphs in the past, including in 1998 when the Stockbridge men won the double. He admits seeing teenagers like Mackintosh, Charlie Peet and Jamie Cairns coming into the top team this year gives him a great amount of pleasure and he says the overall club spirit this summer has been as good as he has ever known it. “The way young Tom batted with no fear in the semi-final, wow that was impressive to watch,” Davidson remarked. “The blend of experience and youth we have in the team works really well and everyone is enjoying their cricket. “That is down to the likes of captain Preston Mommsen, [player/coach] John Blain and Neil McCallum who create a fun environment and a spirit which means everyone wants to learn and play for each other. Grange are going for their ninth Cup win and the first since 2014. Before the big game the two sides meet on Saturday at Goldenacre in the league with a win going to be enough to give Grange the title. Mazars Grange (from): Preston Mommsen (c), John Blain, Andrew Brock, Dylan Budge, Jamie Cairns, Harris Carnegie, Stuart Davidson, Nick Farrar, Ryan Flannigan, Tom Foulds, Gordon Goudie, Tom Mackintosh, Neil McCallum, Charlie Peet. Heriot’s (from): Keith Morton (c), Hayes van der Berg, Peter Ross, Loedolff Potgeiter, Elnatan Meiri, Michael Shean, Chris Ashforth, James Hearn, Simon Whait, Ryan Brown, Elliot Ruthven, Alex Knapman, Sean Weeraratna.